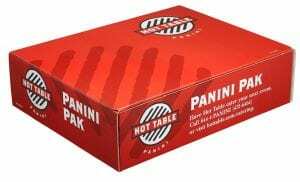 Make your event special with a Hot Table Panini Pak! Served on our signature bread. You can select the panini you want from our menu, or we can send a standard assortment. Select your food and beverage options below based on your group size. Get Rewarded with Each Purchase!